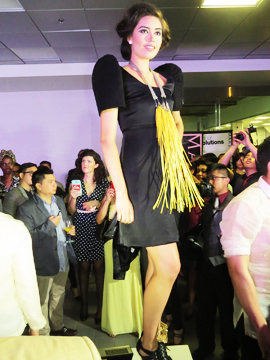 VINTA is the first Canadian line to showcase a modern take on traditional Philippine designs. The collection features the traditional terno dress which displays exaggerated, winged sleeves. VINTA also switches traditional Filipino gender roles by fashioning a barong, typically worn by men, for a women’s piece. Definitely my favourite of the bunch! The message of Caroline’s collection is that even though you may evolve and change, you must still remain true to your roots. “VINTA becomes a visual The VINTA collection Photo by Candice Kayerepresentation of the significant contribution Filipinos make to Canada’s cultural mosaic,” she says. 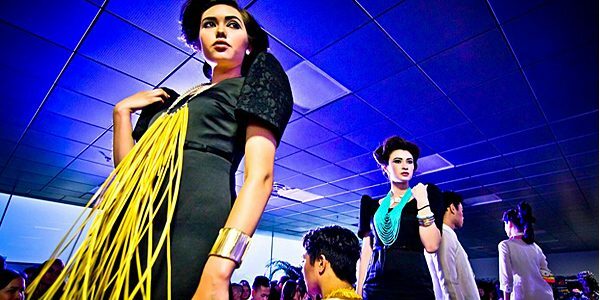 “Often when Filipinos think of cultural clothing, they think ‘costume,’” Caroline says. “That’s what I wanted to change.” Through VINTA, she has used traditional Filipino fashion and infused it with modern, Canadian style. “That’s my inspiration: chic, wearable, fashionable clothing that shows your cultural pride at the same time,” Caroline says. VINTA not only celebrates Philippine fashion, but it also supports youth art and cultural programming through the Kapisanan Philippine Centre for Arts and Culture. The centre, which was co-founded by Caroline, provides training for Toronto-Filipino youth who hope to work within the fashion industry.